Shawn VanDiver is a 12-year Navy veteran, faculty at three universities, and serves on several boards focused on human trafficking, national and international security, and emergency management. 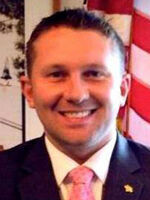 He is co-director of the Truman National Security Project San Diego Chapter. Follow Shawn VanDiver on Twitter @shawnjvandiver. Estimates are that anywhere between 22 and 50 veterans commit suicide every day in our country. Although it’s a tragedy, I don’t find it very shocking. My favorite part about living in San Diego is that when I tell someone where I am from, the first comment is inevitably about the weather. And who can argue? A recent trip to D.C. reminded me just how gorgeous it is here. They often talk about the beaches; sometimes they say “Oh, Gaslamp, right?” or something about Comic-Con. These are the things our town is known for.